Jesper Voxnaes is not only renowned for his ingenious knife designs. He has also created some great concepts in the area of tomahawks. Therefore, the Vox T-Hawk is also characterized by the customary versatility and functionality. 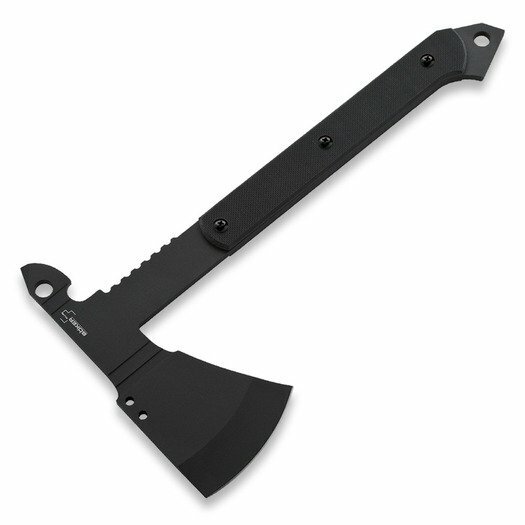 The sturdy construction is made of one single piece of SK5 carbon steel which has been equipped with a resistant powder coating in order to protect the knife against corrosion. The cutting edge has a hollow ground which ensures extreme sharpness and can master a great multitude of cutting tasks. The G10-scales have been threefold screwed and can easily be removed. Alternatively, a Paracord handle wrapping can be fitted which is included in olive and in orange (in suitable length). Openings in the tang reduce the weight and facilitate the fitting of the wrapping. All in all a fascinating tool that clearly stands out thanks to the unique design. Blade material SK5, delivered with nylon sheath. Abyste získali dopravu zdarma, chybí vám objednat zboží za Kč 192!